What is Single Sign On, why is it so important for online businesses, and most importantly who can use it? For those who come from a non IT related background, Single Sign On (SSO) functionality is designed to manage and consolidate your log in username and password credentials for multiple applications within the same or different enterprises. The SSO process authenticates the user for all the applications they have been given rights to and eliminates further prompts when they switch applications during a particular session. To put this into context, I will give you an example of our work for the Telegraph Media Group (TMG). The Single Sign On feature we implemented allows TMG users to have a seamless experience across various sections of their website. Once on the Telegraph Media Group’s website, the authenticated user can easily move from the My Telegraph to the Announcements section without the need of having multiple accounts. The transition form one section to another is simple and makes the users journey faster, seamless and more enjoyable. Example of Single Sign On on The Telegraph website. 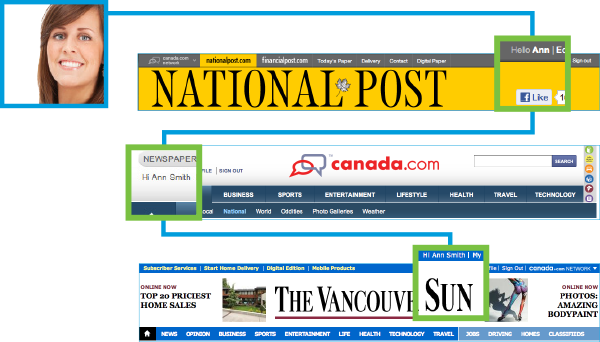 Another example is the Single Sign On enabled by Postmedia Network, which allows users to have a seamless experience across three of their largest newspapers, NationalPost.com, VancouverSun.com and Canada.com. Photograph Source: Janrain. Thank you for permission to use this photograph. Social Sign On is also a form of Single Sign On, as it allows users to authenticate at a single location (Facebook/LinkedIn/Twitter/Google +) with a single set of credentials and access another platform (newspaper/e-business/forum). 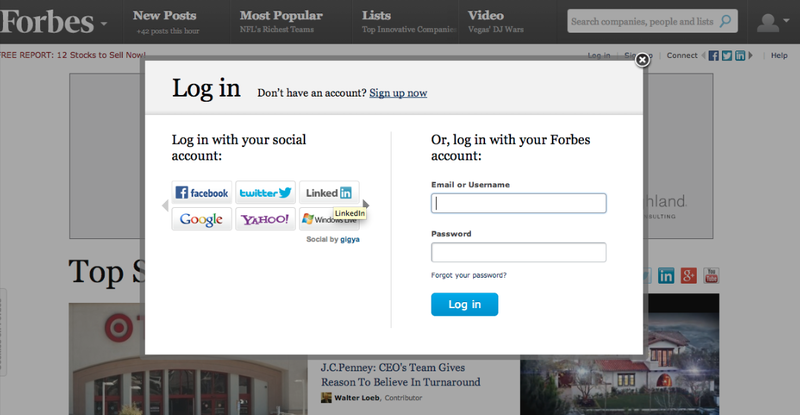 Example of Single Sign On via social media networks on Forbes magazine. What other advantages has a SSO feature for an online business? Increases security – Single Sign On can also configure automatic logging out policies for users to prevent unauthorised access. If you use online banking often, you will have come across similar policies – if you are inactive for a defined amount of time you are automatically logged out. Can reduce phishing - Phishing, a fraudulent process where victims are tricked into giving away sensitive user information, increasing security for you and your users. If your magazine has various sections such as a forum, blog, competitions and your users need an account for each section then considering a SSO solution can be a wise thing to do, both for your business and your readers. What is most important however, is that SSO is used not only in the publishing industry but in wide range of businesses: from universities to banks, everyone who provides a host of services needs SSO to improve their users experience. If you’re a business who implemented Single Sign On or a visitor of a website who uses such services please share your thoughts with us. I would love to hear your thoughts on how Single Sign On impacted your online experience.